The Grey Eagle Prize Package includes a 1 night stay in the Grey Eagle Resort King suite, 2 Show Tickets and 4 Buffet Tickets. 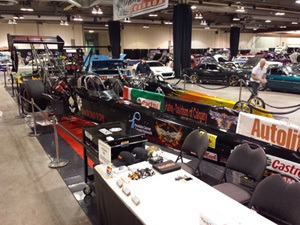 Thank you to our sponsor Lift King for supplying the beautiful red and black flooring for our Dark Side Racing display. Not only is the flooring visually stunning, it is incredibly strong and durable. 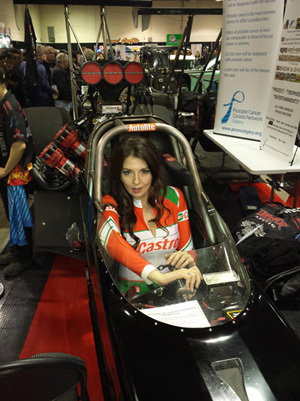 We were very fortunate to have Dark Side Racing Sponsor "Castrol Canada" on site at the World of Wheels and even more fortunate to have two of the Castrol Girls join us at our World of Wheels booth for a photo op. Thank you to the oh-so-gorgeous, confident and incredibly well-spoken Castrol models Carolynne Scoffield and Niki Middleton! It was truly a pleasure to meet you both and we hope to have you out at more events on our 2015 Dark Side Racing Calendar. Dark Side Racing would like to give a special shout out to our team sponsor Bent 8 Kustom Apparel. Bent 8 put on one hell of a Pin Up Contest. 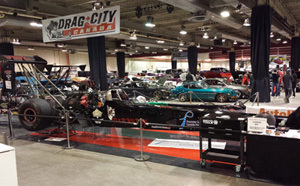 Congratulations to Brittany Van-Kellough - winner of the World of Wheels Pin Up contest and congratulations to Bent 8 on a job very well done! Jeff Heeg is the lucky winner of the Keurig Prize Package that was donated by Keurig Canada.